Leeds United captain Liam Cooper thanks fans after the win at Bristol City. With confidence they hope restored Leeds United now head for back to back home games as they look to fully get their promotion bid back on course. With four defeats in five Sky Bet Championship games after previously being unbeaten faith in Thomas Christiansen and his United team was understandably being questioned, but he made some big decisions for last Saturday’s match at Bristol City and they certainly came off. The head coach had already shown he was not afraid to make some bold choices in opting for Andy Lonergan in goal ahead of big summer signing Felix Wiedwald for the previous game. This time he left out Pontus Jansson, recalling on-loan Matthew Pennington into the back four, and the response was a clean sheet. It was not the perfect defensive display as Bristol City did miss some decent chances, but it was no mean feat to prevent their free scoring hosts from finding the net. Another big decision concerned the tactics with the 4-2-3-1 formation employed in every game previously changed to a 4-3-3 with Pablo Hernandez sacrificed and Ronaldo Vieira brought back into the line-up. According to many fans it was not before time that Vieira was restored to the side, although a knee injury had been hampering him and he is now fully recovered according to Christiansen. Interestingly the player many thought would have given way to Vieira had a strong game with Kalvin Phillips one of the best performers on the day – another vindication for the head coach. It was important too for United to get their scoring boots back on after just one goal in their previous three matches and Christiansen was pleased with the display of striker Pierre-Michel Lasogga. He said: “I had my talk to him. I expected more from him in the last games, there hasn’t been enough – what he gave us, especially keeping the ball. After beating one top four side the Whites now have to try to defeat another as they take on surprise packages Sheffield United at Elland Road this Friday night. The Blades will arrive in third, one place and four points above Leeds after winning nine of their first 13 games following promotion from League One. Chris Wilder’s men have maintained their confidence from last season and managed to do what the Whites could not, by beating Reading at home last Saturday. 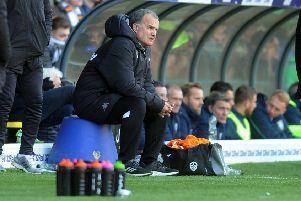 They already have a big derby victory to their credit, having beaten Sheffield Wednesday and they also defeated league leaders Wolves so have proved their ability in the big matches while Leeds boss Christiansen has yet to taste success in a derby in England after his team were well beaten by Wednesday. He has at least one selection decision to make with full-back Gaetano Berardi suspended after his rush of blood to the head – literally – and subsequent sending-off at Bristol City. Fit-again utility player Vernon Anita is favourite to come in, although Stuart Dallas has been used on occasion this season at left-back and on-loan Manchester United defender Cameron Borthwick-Jackson is another option, although he was injured in the Carabao Cup defeat at Leicester City. Christiansen is set to utilise his squad where he can with the games coming thick and fast and Leeds also in action next Tuesday when at home to Derby County. The Whites boss, meanwhile, was happy with the display of his much changed Leeds line-up at Leicester. He said: “We knew about the quality of the Leicester team and I am proud and happy about the performance of the team, especially in the first half. “We conceded a goal shortly after our goal and maybe if we could have kept the lead until half-time then who knows?